Are you guys ready for Fall? Yeah, me too. Fall is my favorite time of year. I love the colors, the cool breezes, and the leaves fluttering across the yard. 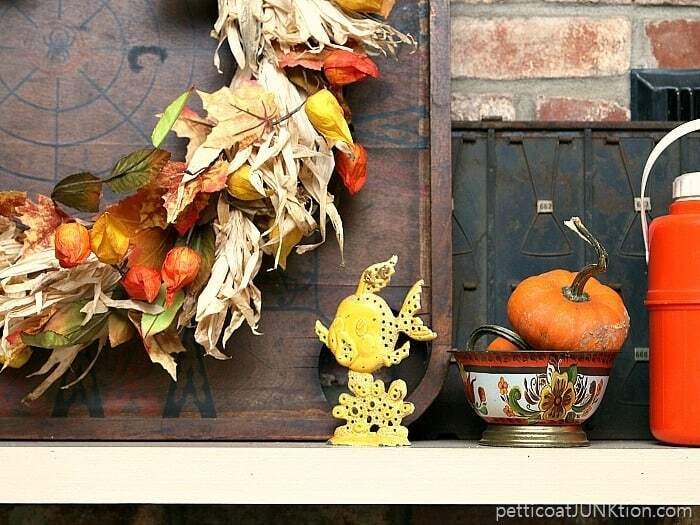 Today is about decorating my mantel for Fall. I start by choosing a mantel decorating theme. Then the rest is easy. Today is the first day of our yearly Fall Ideas Tour. There are 28 blogs sharing decorating ideas on everything from porches to mantels. We added an extra tour day this year just for porches. I can’t wait! I need inspiration for decorating our front porch. First up on the Fall tour is mantels. I decorated my mantel on Saturday. It didn’t take long at all, less than 2 hours, and I’ll let you in on my oh so secret technique. This is how the fireplace and mantel looked before the Fall makeover. When I redid the mantel at the end of July I shared my 6 Tips To Make Fireplace Mantel Decorating A Breeze Without Breaking The Bank . On the last shopping trip to my favorite junk shop I found a few items that would be perfect for the mantel. This bunch of treasured finds cost a total of $9. I incorporated a few of the pieces into the mantel décor and the rest are waiting for makeovers. Step 1. Start with a clean slate. Remove everything from the mantel and hearth. This is the best way. If I start with a few things on the mantel and start adding or replacing things it doesn’t work out as well. Step 2. Decide on a theme and color scheme. This is the most important step. Choose a theme like; pumpkins, flamingos, wreaths, frames, etc. Then decide on your color scheme. Or you could start with the color scheme first then pick a theme. Whatever works best for you. Step 3. Shop your home, workshop, garage, etc. for items that fit the theme. Choose objects in varying shades of your color choice. 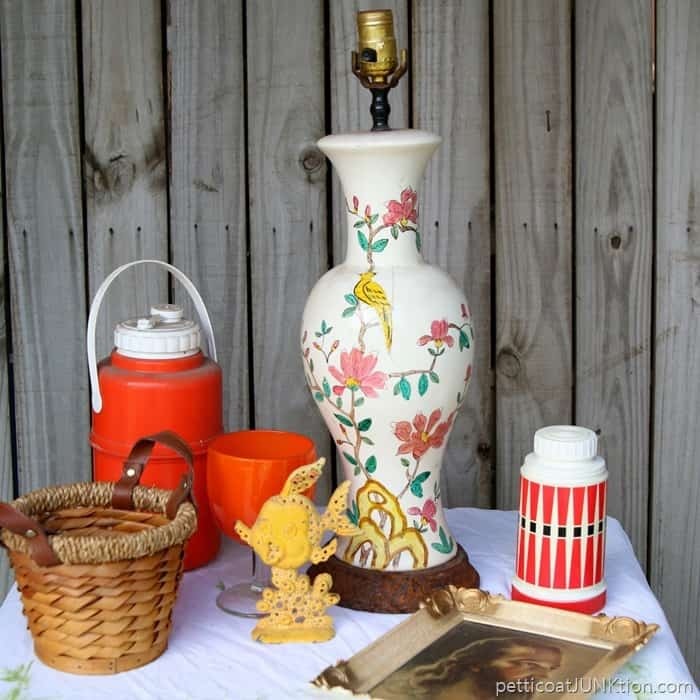 Grab things you wouldn’t necessarily think of as “decor” and add them to the pile. Think….dishes, fabric, bottles, silverware, lamps, architectural pieces, etc. I gather a ton of things. Some I use and sometimes I have to hunt the house for more stuff. Step 4. Start by putting your focal point on the mantel first. Next add other things…. taking away, adding to, and swapping out as you go. Your focal point could be a wreath, a game board, large shutters, vintage windows, etc. You could also use multiples of the same item. This idea works great. Step 5. Take a photo of the finished display (secret technique I mentioned earlier). Look at the photo and see if everything flows together or if something stands out a little too much. Tweak the display and you’re done. I like using unique finds on the mantel. The orange goblet had me at …well….orange. Orange, green and yellow are the colors of our den. I could have filled all the thermoses with flower stems but I left them as is. The colorful lamp shade is sitting on a large spool and the wood piece behind the spool is part of a vintage radio cabinet we took apart. 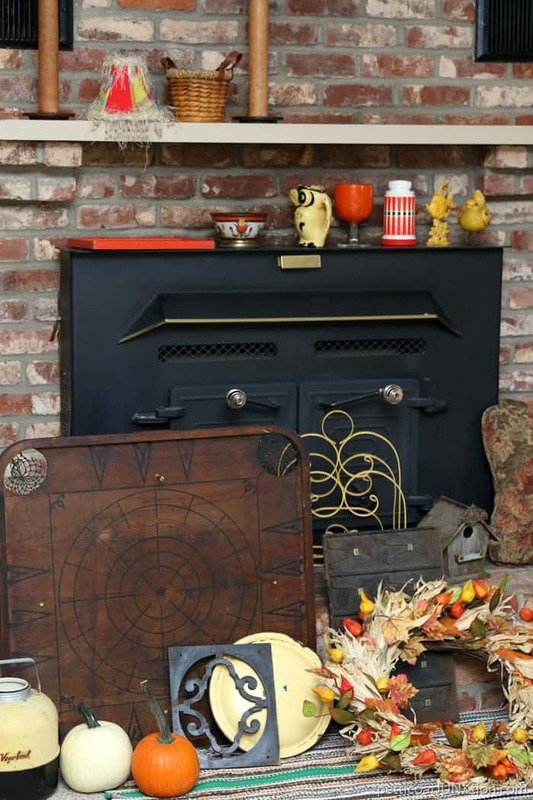 The pieces on the hearth are some of my favorite junk treasures. The yellow metal magazine rack is a recent purchase from Pigeon Forge, TN. My friend Beth of Farm Fresh Vintage Finds and I spent a few days in the mountains to unwind. Girls trip! My favorite find from last week’s junkin trip is the yellow earring holder. That little girl is so darn cute. The wreath is the only new purchase in the lot. I usually make my own but I was in TJ Maxx a couple of weeks ago and spotted this one. It was a pretty good buy at $24.99. The pumpkins came from a local vegetable/flower market. How do you like the way I left the pumpkin au naturel….in this instance meaning…..with dirt. Don’t know about ya’ll but I’m loving the look. Patting myself on the back. That’s it folks. 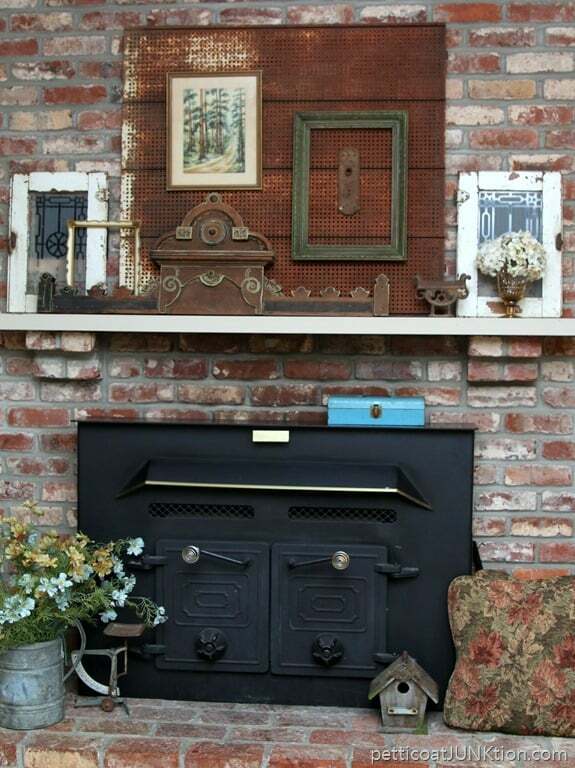 What piece on the mantel or hearth do you like the best? 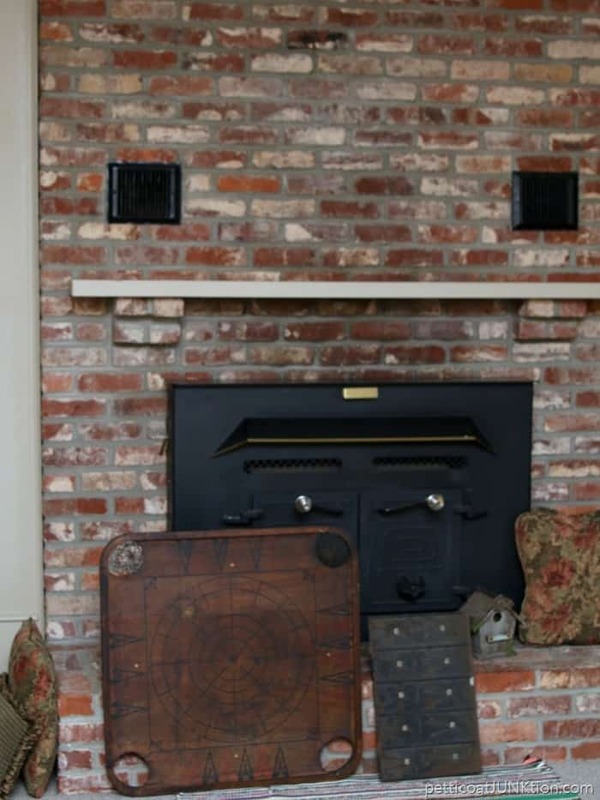 Do you have a fireplace mantel? If you don’t, consider decorating a large shelf or buffet instead. Now it’s tour time. Just click those “pink links” below. No problem! You can decorate a table or a shelf using the same stuff! I love that wooden tray behind your wreath!! Such a gorgeous and versatile element. Definitely going to be on the look out for one the next time I’m at the thrift store. Thanks for sharing your tips and beautiful mantel with us at Merry Monday this week! Love your mantel, Kathy! That gameboard as a backdrop for your wreath – genius! Love it so much!!! Pinning! Love it. I can’t believe you found all of that for $9. That vintage game board is my fave. Fabulous! What a fun mantel… love your style girl! I love it all Kathy!! 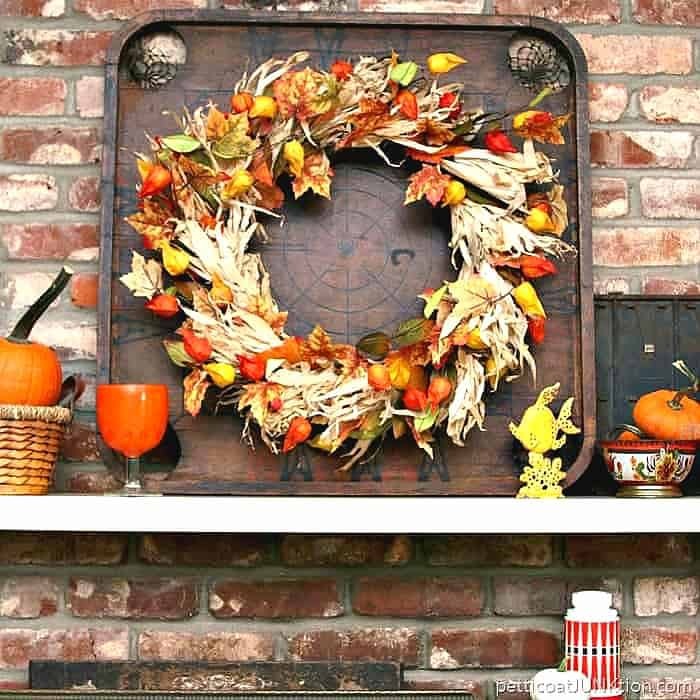 So many great vintage touches … I especially love that Wreath on the old Game board! Love it Kathy, fun and funky is my kind of mantel! I need that antique game board! That wreath on the Carrom board is KILLER! Did the board come that way (i.e., dark) or did you stain it?? I just LOVE how dark it is, compared to the ones we have. A mantel of mismatched stuff and you want me to pick one fav? Nope. I love all the goodies you gathered here friend! 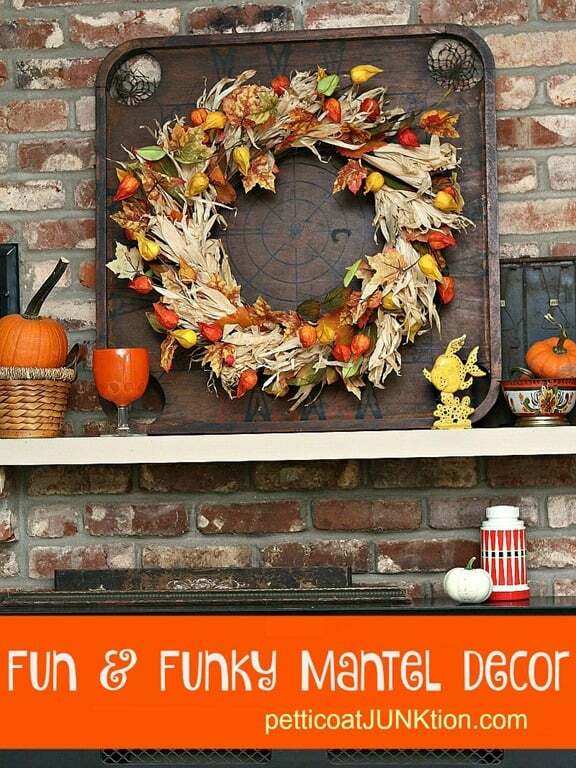 LOVE, LOVE your fun and funky mantel!…Love the old game that you used as a backdrop to your gorgeous wreath…yes, lots of Fall inspiration here on the tour! You are definitely fun and funky, Kathy! 😉 I love how you’re not afraid to show off your style and mix unique pieces. Happy Fall! Kathy, I printed “Marie” for your name – that’s because Marie Blackburn is one of my favorite bloggers and I read her blog and yours – my two top picks! Sorry about that. I love you still. I love the wreath on the dark brown board – is that a game board? I don’t recognize it as such and wonder about the cut-outs (glass holders?) in the corners. I love your little green and orange candleholder w/the orange pumpkin on top. Clever you! Your mantel looks so pretty and I love that you used unexpected items when you decorated it like the earring holder. Your tips are good ones to remember when decorating a mantel because it’s never easy! So fun and funky is right! !, love it and the tips! 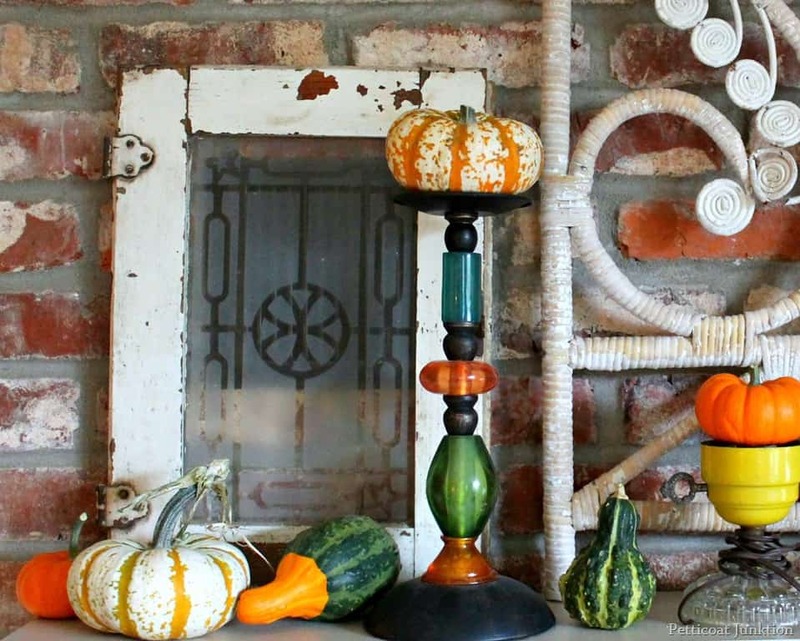 Love everything you found for your mantel! It is fun touring with you this week! I wouldn’t expect anything less than a Funky Fall Mantelscape from you, Kathy! I love all the quirky and unexpected elements you’ve incorporated into it. The board game focal point is awesome!!! Love your mantle! Love the little earring girl too! Thank goodness Fall has finally arrived…if only the heat would go away! Love your colorful and funky mantel. The board game backdrop is super cool and creative! The wreath is the perfect finishing touch. I too am ready for Fall, and the cooler weather. Not so much for the raking of leaves part of fall though. 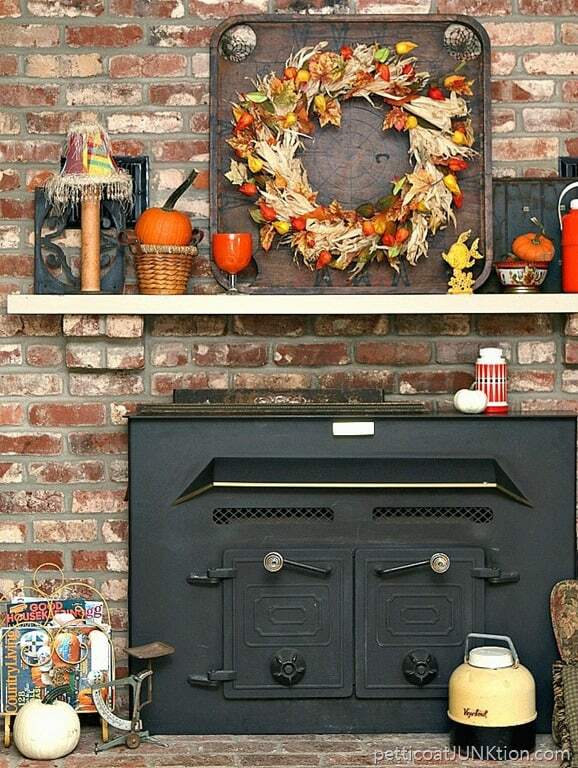 Your mantle is beautiful with all the fall colors. The little girl earring holder is super cute! Love the wreath! Thanks for sharing your tips for setting up a fall mantle!